J. World's Poult. Res. 2(4): 63-69, 2012. ABSTRACT:Â A study was conducted on spontaneous cases of Salmonellosis in different commercial broiler farms of Srinagar district and adjoining areas within the period from April 2008 to Oct 2009. A total of 42 outbreaks of Salmonellosis were recorded which included 24 outbreaks of fowl typhoid, 8 of paratyphoid, 3 of pullorum disease and 7 due to untypable serotypes. Clinical signs generally included ruffled feathers, huddling near the source of heat and light, anorexia, increased thirst, reluctance to move, pasted vent, diarrhoea, prostration, reduced growth rate and rarely lameness. The gross lesions comprised of hepatomegaly, bronze discoloration of liver, splenomegaly, congestion and necrotic foci on liver and spleen and pericarditis along with greyish white nodular lesions on heart. The lungs revealed varying degrees of congestion and haemorrhage. Bursa was atrophied and caeca revealed presence of caecal core. Histopathological alterations were observed principally in the liver, spleen, heart, kidney and bursa. Changes in liver and spleen comprised of congestion, haemorrhages, areas of necrosis, reticular endothelial hyperplasia along with mononuclear cell and heterophilic infiltration. Heart revealed congestion, focal and extensive infiltration of mononuclear cell and heterophils which occasionally resulted in atrophy, necrosis and replacement of muscles fibres by infiltrating cells. Depletion of lymphocytes was observed in both the spleen and bursa. Intestinal changes comprised of congestion of mucosal vessels along with marked hyperplasia of goblet cells and infiltration of heterophils and mononuclear cells in the lamina propria of villi. Howieda D. Ahmed, Khalid M. Elamin and Khadiga A. Abdel Ati. J. World's Poult. Res. 2(4): 70-72, 2012. ABSTRACT: The present study was conducted to assess the effects of Furazolidone incorporation in broiler feeds under Sudan Conditions. 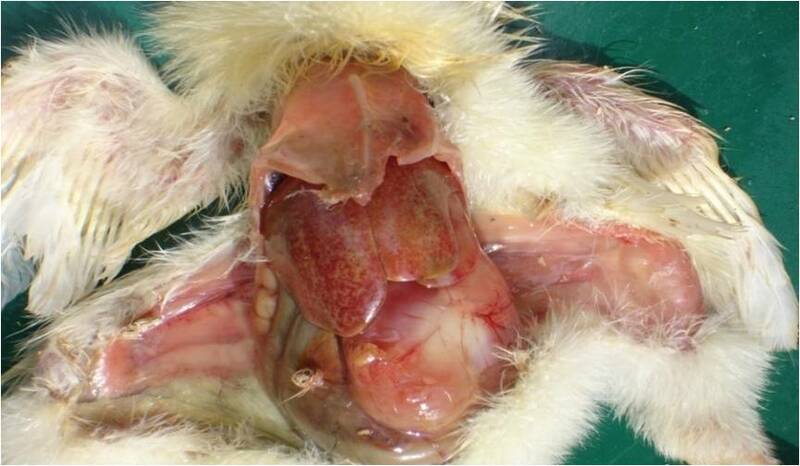 A total of 144 one-day old non sexed chicks of Lohmann breed were used. Experimental chicks were distributed randomly into 4 treatments, each with three replicates (36 birds/treatment and 12 birds/pen as replicate).Four diets were formulated to be isocaloric and isonitrogenous, supplemented with graded levels of furazolidone (0,100, 200, 300 mg/kg feed). Traits studied were feed intake (weight gain), body weight and feed conversion ratio. Results revealed that body weight, weight gain, feed consumption and feed conversion ratio were not significantly at (P ≤0.05) affected by different levels of Furazolidone. Final body weights at slaughter age (7 weeks) was in the range of 1592±45.9- 1706±45.9 g. Weekly weight gain was highest in the fifth week (322-391 g/ day). Average weekly feed intake increased with the advance in age and it approach 100 g in the seventh week of age. Total feed conversion ratio was in the range of 2.24±0.05-2.34±0.05.It is concluded that Furazolidone has neither positive nor negative effects on the performance of broiler chicks. It is suggested that this drug can be used in poultry farms were the hygienic and managerial conditions were poor. J. World's Poult. Res. 2(4): 73-78, 2012. ABSTRACT: Marek’s disease is an economically relevant lymphoid neoplasm of poultry, caused by oncogenic strains of Marek’s disease herpesvirus. The disease has been controlled effectively by vaccination with attenuated or non-pathogenic MDV strains. Different vaccines have been tried out and the underlying principle for immunity is the action of antibodies targeted against membrane specific antigens and cytotoxic effect against tumor cells. Marek’s disease virus is a particularly unwieldy herpesvirus to manipulate molecularly and many of the techniques performed routinely for other herpes viruses are not yet available for the MDV machinery. The postulated mechanisms of immunity against Marek’s disease have been discussed here in detail. Vaccine breaks do occur as field strains continue to evolve towards pathotypes of increased virulence, and this evolution is of course vaccine driven. Experimental solutions to improve protection against the disease, like recombinant vaccines, have been discussed in this paper. Key words: Herpesvirus, Immunity, Marek’s, Pathogenic, Poultry, Vaccines. Bahaadin Shamseborhan M and Safamehr A.
J. World's Poult. Res. 2(4): 79-80, 2012. Etuk E.B., Opara M.N., Okeudo N. J., Esonu B.O. and Udedibie A.B.I. J. World's Poult. Res. 2(4): 81-89, 2012. ABSTRACT: These studies were conducted to determine the effects of two varieties of sorghum, Samsorg 17 and ICSV 400 on the haematological and serum biochemical parameters of local turkey breeds, reared in Nigeria. Two hundred and sixteen poults were divided into 9 treatment groups of 24 each, which were further replicated thrice and fed starter diets containing Samsorg 17 and ICSV 400. Similar (P > 0.05) RBC and PCV values were obtained with the two diets. Samsorg 17 fed poults produced lower, though not significantly (P > 0.05) serum albumin, glucose, urea, creatinine, sodium, chloride, ALP, SGPT and SGOT values than those on ICSV 400 diet. Higher RBC, MCHC, MCH, MCV and PCV values were observed with Samsorg 17 fed turkeys than those on ICSV 400 diets. Serum glucose and creatinine decreased and SGOT increased with dietary sorghum. Similar (p > 0.05) Hb, WBC, MCHC, MCV and PCV values were obtained in all groups. Values of serum biochemical indices assayed except urea, calcium, potassium and chloride showed no significant (p > 0.05) differences among the treatment groups. It was therefore concluded that Samsorg 17 and ICSV 400 sorghum varieties could sustain local turkey production without any on toward effects on their haematological and serum biochemical indices.